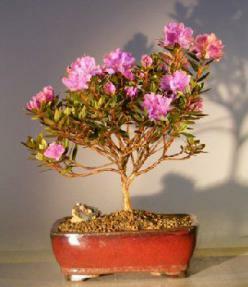 This dwarf rhododendron is a dense evergreen and is noted for its large trusses of showy purple azalea-like flowers. It has very small blue-green leaves which turn bronze in winter. New growth is bluish-green. Evergreen. Keep outdoors. 7 years old, 12" tall.